The 1,800-seat main sanctuary of Trinity Church in Lubbock, Texas is housed underneath a unique 15-sided dome originally built in the 1970s – a time when asbestos-based insulation was still allowed. Recently, when health and safety regulations compelled the church to remove the old asbestos insulation and install new sprinkler systems, church leadership decided to seize the opportunity for a complete renovation of the entire structure, stripping it down to the outside shell and installing new seating, a new stage, and all new audio, lighting and video systems. The world-class AVL package was designed and supplied by Summit Integrated Systems of Lafayette, Colorado. The audio brief entailed bringing a greater degree of focus and clarity to the worship services, at a level well beyond what was realised with the ageing centre-cluster system that was removed. As is well known to all acousticians, dome-shaped ceilings are inherently problematic. In the case of Trinity, removal of the “popcorn” asbestos ceiling treatment actually exacerbated the potential problems. Therefore, the new audio system would have to exhibit a far greater degree of control to keep sound focused on the congregation, while at the same time providing significantly greater power and headroom to accommodate the church’s highly contemporary and youth-oriented music programs. The new system comprises dual main hangs of nine per side Leopard compact line array loudspeakers, augmented on the extreme sides by pairs of UPQ-1P loudspeakers directed at the upper and lower seating areas. The UP-4XP loudspeakers deployed as front fill (8) and under-balcony delays (24) all incorporate Meyer Sound’s exclusive IntelligentDC technology, combining the inherent performance advantages of self-powered loudspeakers with the installation ease of constant-voltage distributed systems. 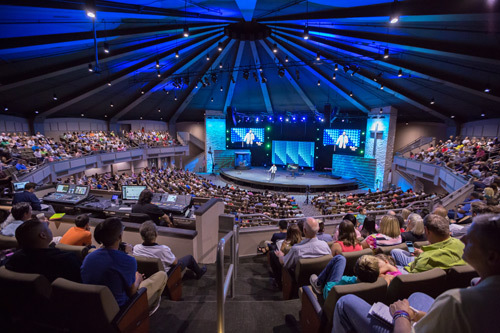 According to the church’s pastor of technical arts, Michael Koontz, the new Leopard arrays have overcome the acoustic challenges. With the old system, he recalls, there was no sense of directionality, of a defined sound source, as sound was bouncing off every surface. The audio system renewal also included new Yamaha digital consoles (CL5 at FOH and CL3 at monitors) and upgrading of the existing Shure UHF-R wireless microphones with new ULX-D systems. The wireless IEMs are Shure PSM-1000. Trinity Church adheres to very high production values in worship, expressing an overall commitment to excellence. The lighting systems had to realise some very sophisticated effects yet at the same time allow operation by non-professional volunteers. The lighting system operation centres around a Martin M6 console for fast programming and extensive playback control all from one console. The installed package also included three software licenses for advanced operations and offline programming. The main wash of the new lighting system comprises fixed and moving elements from ETC, Elation and Martin. The full complement of colour and moving head fixtures, a total of 66 in all, was drawn from Martin’s Quantum Profile and MH6 ranges. 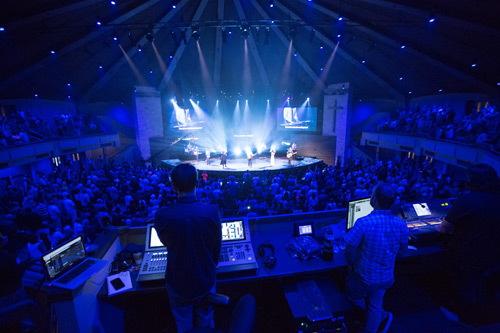 For video technologies, the goal was to create a visually more dynamic worship experience. 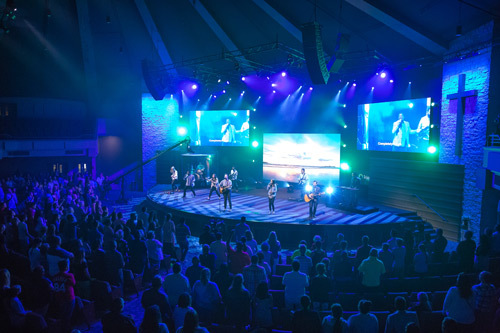 To realise this objective, Summit designed an installation that moved the church boldly from the standard definition projection of the 20th century into the new, cutting-edge technology of bright, high-definition LED walls. The two side walls, each measuring 16.8 feet by 9.5 feet (5.1 m x 2.9 m) while the centre wall measures 21 feet by 11.8 feet (6.4 m x 3.6 m). Each screen has its own Barco Image Pro Jr video scaler/scan converter and switcher. Total pixel count for the installation is more than 3.3 million. The unusual shape of the dome roof proved problematic. The load engineering safety factor dictated only 10 pounds per square foot would be allowed when hanging anything from the ceiling. This meant carefully evaluating the total weight and weight distribution of all the AVL components. With careful planning, and by employing AVL components with a high power/performance-to-weight ratio, all expectations of the client were met or exceeded within these strict limits. The complete technology package from summit also included architectural lighting controls by Interactive Technologies, in-trough foot lighting from ChromaQ, and flying-out capability for the centre LED wall with motors and lifts by Chain Master and controller from Motion Labs.